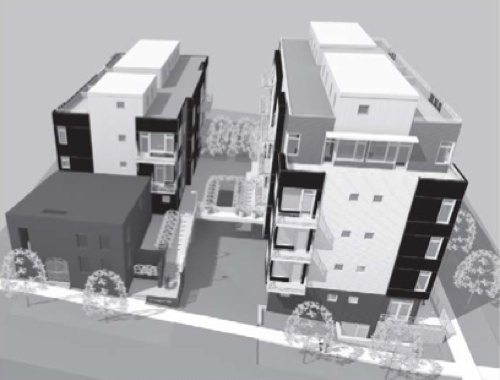 The 121 Kingsley West condominium development will be moving to city council for consideration, following action at the Ann Arbor planning commission’s July 15, 2014 meeting. Rendering of 121 Kingsley West project, looking south from Kingsley. The existing building is in the left foreground. The project calls for rezoning the site from a planned unit development (PUD) to D2 (downtown interface). The development would include renovating the existing two-story, 2,539-square-foot building, plus constructing two additional buildings: (1) a 3.5-story addition to the existing building; and (2) a 4.5-story structure at the southeast corner of West Kingsley and North Ashley. In total, the development would include 22 units and 40,689 square feet. The estimated cost is $6.5 million. Developers are Tom Fitzsimmons, Peter Allen and Mark Berg, who all attended the July 15 meeting. Fitzsimmons and architect Marc Rueter answered questions from commissioners. There would be 29 parking spaces below the buildings – though only two spaces are required, based on residential premiums that the project is seeking. The premiums give the project additional floor area, compare to what’s allowed by right. An elevator for each building will be accessible from the parking level. The parking level of the east building will include a bike room with 14 spaces. Commissioners unanimously recommended approval of the rezoning, site plan and development agreement. However, only five commissioners on the nine-member body were present, and the commission’s bylaws stipulate that approval requires six votes. So the project will be heading to city council for consideration with a recommendation of denial from the commission. Wendy Woods, who was elected chair earlier in the meeting, assured the developers that city council would be informed that the project secured unanimous support from all commissioners who were present. The project is on the same site as a previously proposed project by Peter Allen called Kingsley Lane. That had been envisioned as a larger development with 46 units in a complex with two “towers” – at four and nine stories. According to a 2006 Ann Arbor News article, pre-sales of the units were slower than expected because of the struggling housing market, and ultimately financing fell through. At a July 9, 2013 planning commission work session, planning manager Wendy Rampson reported that the developers had lost the property to the bank, but subsequently secured the land and were expected to submit a new site plan. The PUD for Kingsley Lane had expired. This brief was filed from the council chambers at city hall, 301 E. Huron, where the planning commission holds its meetings. A more detailed report will follow.